Norton "Nort" Philip Gassman passed away on March 1, 2016 at Munson Hospice House in Traverse City. Nort was born in Beulah, Michigan on November 19, 1932 to William Dale Gassman and Marie (Kropp) Gassman. 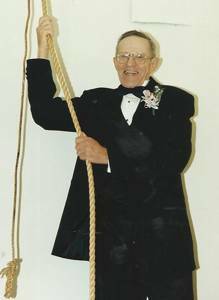 He graduated from Central High School in 1951 and married his high school sweetheart Suzanne McGinley on September 13, 1952. Nort served in the U.S. Navy during the Korean War and was especially proud of his service in Italy and his work as a Navy Corpsman. After serving four years, Nort and Sue returned to Traverse City where they raised their family. Nort retired from maintenance in the gas and oil industry in 1997. He and Sue enjoyed their retirement by traveling the United States and spending time with their family. Nort was an accomplished woodworker who enjoyed sharing his crafts with others. He was especially talented at building doll houses and small replicas of Leland's fish town, for which he was known for his impressive attention to detail. He is survived by his wife, Suzanne of Traverse City; five children, Ann (John) Silny of Rowlett, Texas, Bill of Grayling, Linda Anderson, Nancy (Mark) Walters, and Katie (Ken) Kubesh all of Traverse City. He also leaves behind 13 grandchildren, 11 great-grandchildren, and one great-child on the way. He is preceded in death by his parents, William Dale and Marie Gassman and son-in-law, Dennis Anderson. Cremation has taken place. A graveside celebration of his life with Military honors will be held at Linwood Cemetery and announced this spring. Memorial contributions can be given to the Korean War Veterans Assoc., Northwestern Michigan Chapter #38 or the organization of one's choice. Please visit www.lifestorytc.com to sign the guest book and share a message with Nort's family. The family chose Life Story Funeral Home, Traverse City.